You may have heard the saying: “If you think safety is expensive, try an accident!” The cost of getting health and safety wrong can be sky high from fees, penalties and fines, to insurance pay outs, loss of work time and damaged equipment or products. Not to mention your moral responsibility to protect people working in or customers visiting your dealership. 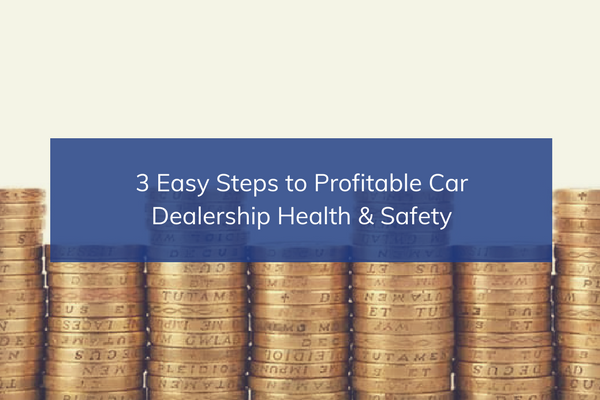 Find out our three easy steps to profitable health and safety. Fee for Intervention (FFI) was introduced in 2012 and allows the HSE to charge firms for the time its inspectors take to identify any material breaches in health and safety regulations, all at a cost of £129 per hour. The revenue generated from FFI by the end of January 2014 cost UK businesses over £10.6m. Avoiding these costly fees and fines isn’t rocket science. Success starts with a written health and safety policy, proactive assessment and management of health and safety risks and sourcing expert support to ensure compliance with regulations. • Act and learn: listen to problems and successes and make improvements. • Who will supervise each worker? • How will the worker be supervised? • Who will the supervisor report to? Creating a positive health and safety culture will ensure you maintain the standards required to avoid FFI and protect anyone working in or visiting your business. Using contractors is common in dealership businesses, for maintenance, repairs, installation, construction, demolition and many other jobs. However, many accidents involve contractors as they often don’t follow the same rules and processes as you. Sometimes you may have more than one contractor on site. You need to think about how their work may affect each other and how they interact with your activities. Clearly, in these circumstances there is more chance of something being overlooked. • What safety and technical competence is needed? • Decide whether subcontracting is acceptable. If so, how will health and safety be ensured? o Is the job going as planned e.g. using necessary Personal Protective Equipment (PPE) according to the conditions of the permit-to-work system (PTW)?? o Is the contractor working safely and as agreed? o Have there been any incidents? o Has there been a change in personnel? o Are any special arrangements required e.g. due to changes in timing, out of hours or weekend work?? o Have any problems arisen which mean you need to rethink the job? • How effective was your planning? • How did the contractor perform? • How did the job go? Effective health and safety is based on effective leadership, thorough processes and consistent standards. Though health and safety can be considered expensive, effective management can not only eliminate the costs of getting it wrong, but also help your business increase productivity through a healthy and engaged workforce. To find out more about managing health and safety effectively in the motor trade, get in touch by calling 0161 486 5020, 0203 1264 997 or emailing us at [email protected].